He is best known as PC Tony Stamp in the ITV police drama The Bill, a role he has played since 1984 . He had made previous uncredited appearances as an unnamed PC. He appeared in numerous episodes of Doctor Who in the early 1980s, often in uncredited roles, such as Marshman and Cyberman. He has also played Melkur in The Keeper of Traken and most recently a Jacondan in The Twin Dilemma. He also made a guest appearance in the final series of Sooty and Co as a policeman called Maurice in the episode ?Delgrub?. He presented and narrated the police video programme Police Stop!. He appeared regularly on Noel?s House Party in sketches with Andrew Paul. Cole was gunged on the show, which was arranged by his mother in law. Cole is a singer. In his early career Graham appeared as the Emperor of China in a record-breaking 1978/79 season of ?Aladdin? at the Grand Theatre in Swansea. Other pantomime appearances have included the role of ?Beast? in ?Beauty & The Beast? at the Woodville Halls in Gravesend and he has appeared in sixteen pantomimes. Cole is a member of the showbusiness charity ?The Grand Order of Water Rats? and was King Rat in 2009. 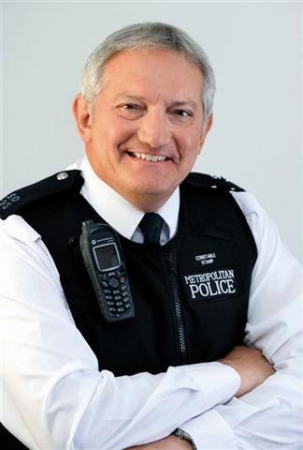 He is President of the National Holiday Fund, which takes sick and disabled children to Disney Florida, has been patron to Childline for over 18 years, and of the Orphans Gift Fund South East London Boroughs, Constables Branch Board, Metropolitan Police.